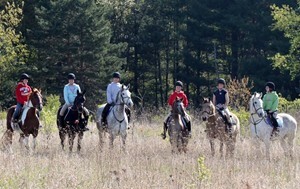 First Job After Graduation: Riding Instructor at Laurel Highlands Ranch in Stahlstown, PA. 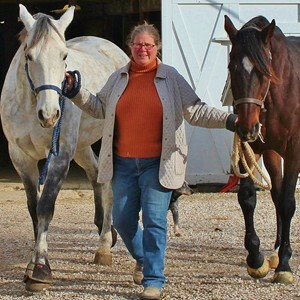 In the decade after graduating from MM, I worked for a number of trainers/farms honing my craft handling race horses, breeding and birthing, starting young horses, and digging into the world of event horses, plus a whole lot in between. In 1986 I took the leap and bought a small farm - no small feat on a riding instructor/trainer’s salary. The last 30 years have raced by, it seems like yesterday when I bought that rundown, century old farm and have slowly turned it into a lovely little corner of the world. Red Roses Farm is a small facility, housing 20 horses. Our mission is to teach the rudiments of riding with the end game of competing at USEA Horse Trials. We do a pretty good job, most years we qualify half a dozen or so riders to compete at the American Eventing Championships. I was one of four professionals honored with the United States Eventing Association Cornerstone Award in its inaugural year. I have to say my favorite MM memories circle around friends Moe, Cindy, Barb and Claire. I was never one to have a posse of friends, living a little isolated as a farm based teen, and that brief dorm/study experience with like minded people is a special memory for me. The certifications offered by MM legitimized my skills to be offered in the workplace. I was a farm kid who liked horses. Not a lot of money was invested in my junior competitive years and I was really rough around the edges. The time at MM brought me up to speed to be employable as an entry level trainer (under a mentor at first - eventually on my own), schooling show judge, competitor and primarily as a riding instructor. The work of teaching people to ride has been my bread and butter for over 40 years and Meredith Manor taught me a good system for teaching a well planned lesson. Never stop learning. You can never wear too many hats - become a judge, a TD, serve on committees. And learn to keep your books meticulously. Keep your equipment/vehicles up to date and in good working order. And, finally, don’t own too many horses - vet and shoeing bills can drag you down.